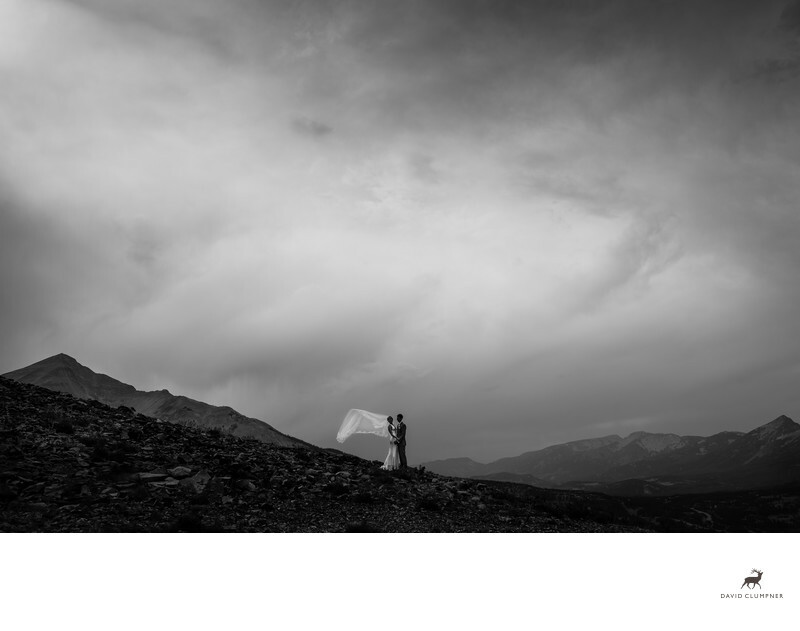 This wedding photograph was captured near Everett's 8800 at Big Sky Resort in Big Sky, Montana. Lone Peak can be seen on the left while Spanish Peaks flanks the couple on the right. The image is a dynamic example of taking a breathtaking scene and adding motion to a stoic pose. We had a breath of wind and the bride kept adjusting her veil as it was catching on the rocks and her dress. When she would pick up the veil and let it go, the wind would carry it briefly before letting it settle back onto the ground. It seemed like I waited forever for this candid moment.When creating this photo, I was trying to imagine something different than the status quo. As a documentary Montana wedding photographer, my goal is to create candid images that tell a story. You see this image stands out from the typical posed images and that is what I stand for. It's easy to take a pretty photograph on top of a mountain, but it's much harder to make it include the grandeur of both the scene and the momentous occasion that brought us there. My imagery has drama, life, and motion, and that is the difference.